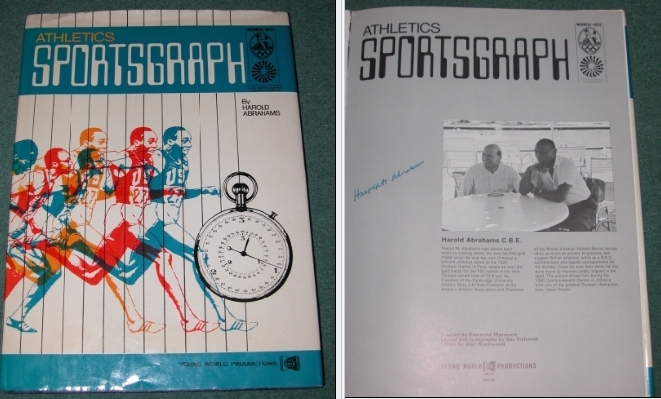 Harold Abrahams CHARIOTS OF FIRE signed book (ATHLETICS SPORTSGRAPH) - 1924 Olympics 100M champion. The film 'Chariots of Fire' (1981) was based on the real life of this outstanding Athlete. The movie went on to sweep the Oscars. Harold Abrahams is also the author of this facinating history of athletics, and medal winning time comparisons. Harold Abrahams won the Paris 1924 Olympic gold medal in the 100m. Winning time 10.6 seconds.